As I write this post I literally feel mind blown by this film I have just watched. 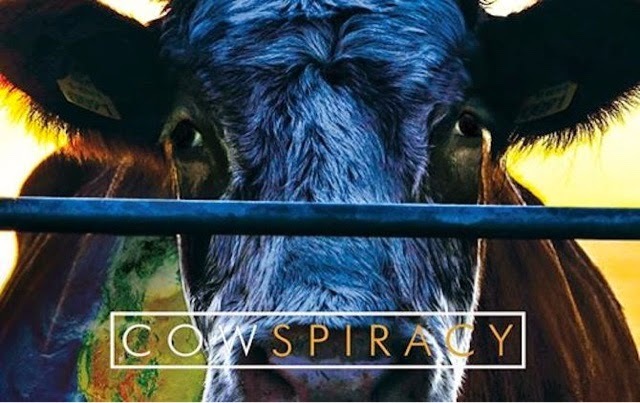 Cowspiracy is a documentary that examines how animal agriculture is destroying the planet we live in. The raising and killing of animals for food is eating away at our world and to continue to produce this level of meat and dairy for human consumption is completely unsustainable. My decision to go vegetarian and vegan was primarily and initially due to my love of animals. Secondly I would have said that I made these changes for health reasons due to the links between eating meat with cancer and heart problems. However, this film has really brought to my attention the environmental factors of consuming animal products and how by adopting a vegan diet you can make an incredible difference to the future of our planet. I had no idea that 51% of all greenhouse emissions are caused by livestock and their products. More than all transportation combined! I also didn't know that rain forests are being destroyed to make room for animals to graze. In fact animal agriculture is the the top contributing factor to habitat destruction, water pollution and species extinction. Livestock covers 45% of the earths land. One hamburger requires 660 gallons of water to produce - the equivalent of 2 months worth of showers! Each day a person who follows a vegan diet saves 1,100 gallons of water, 45 pounds of grain, 30 square feet of forest, 20lbs of Co2 equivalent and 1 animals life. I had no idea my dietary choices were having such a profound impact on the environment I live in! I'm also relieved that my lifestyle choices are having a positive impact on not only my life but also the world. I promote a lot on my blog but if there's one thing that I'd like you to think about its watching this film!